Safety and security are important for any organization, but InformaCast customers use our mass notification software to keep personnel informed about all kinds of events. Aspirus in northern Wisconsin deploys InformaCast across its facilities to standardize paging procedures. This has led to faster response times since staff only need to press a button on their Cisco phones to initiate a message. At Aspirus, InformaCast is used for Critical Code Blue paging. The staff at Aspirus is sensitive to the stress families endure when loved ones go in for surgery. Under the previous paging system, messages were heard throughout the whole hospital. But with InformaCast, staff can be more selective about where the message is heard. That means medical personnel are informed without causing unneeded stress for families. 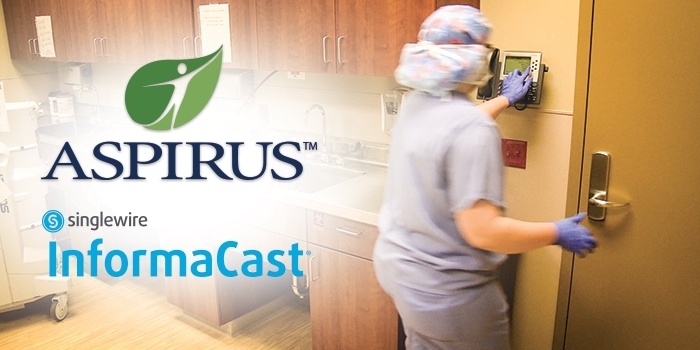 Aspirus is also using InformaCast to help improve its cleaning procedures. Facilities were experiencing issues with elevators getting filled with dirty supplies. They had no way to alert the cleaning team when supplies were loaded into the elevator, so they used InformaCast to set up a paging button on the phone in the elevator room. After supplies are loaded onto the elevator, staff members hit the button on the phone before exiting. An announcement goes over the speakers in the cleaning area, notifying workers that dirty supplies are in the elevator, reducing backups. InformaCast is used in healthcare facilities around the country to help provide excellent patient care. In addition to its paging capabilities utilized by Aspirus, other healthcare facilities are using InformaCast in innovative ways. For example, one facility is using it to track patients that wander outside of their designated areas. Other customers use it for building-wide lockdowns and automated overhead announcements.